What’s in Your Yard? Activity to do & Printables! I think this is a great activity and is easily adapted for school and community learning environments! And Amy even provided pdf printables of her Bio-inventory sheets to get you started! This activity would be great to do in conjunction with the “Life in a Square” lesson in my book Wings, Worms, and Wonder if you are working with that. As my son has grown older, it has become harder to get him outside, especially in the hot Florida summer. He’s also old enough now that I want him to learn about what he is seeing, without making him feel like he’s in school. Trying to pull all of this together isn’t always easy, but creating a bio-inventory might be a way to do that. It’s such a flexible project, just about any family can adapt it to fit their needs. How many different types of caterpillars and butterflies can you find around your house? A bio-inventory project can help you find out. 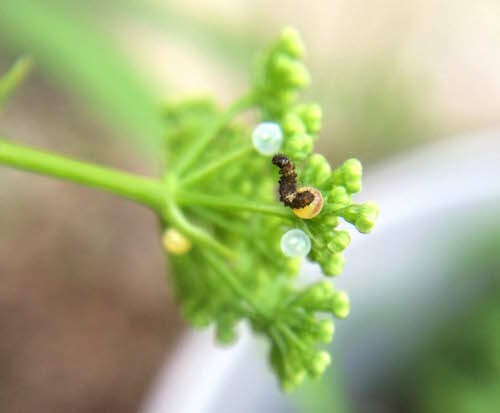 This one is a swallowtail caterpillar. The idea is simply to document what flora and fauna are in a particular space. That space can be your yard or a favorite nature spot. If the kids are wild about animals, then focus on the fauna and leave the flora for later. Since each environment goes through seasonal changes, the inventory is a living document from season to season and year to year. This is a great project to do when you need a little push to get outdoors or are left with a few spare minutes that you need to fill. Yes, it can be that simple. So how do you create an inventory? It really is up to you. I think documenting the life in my backyard works best by using multiple methods. That means I may use the macro lens on my cellphone for pictures of small insects, but my watercolor paints for a nice leaf or flower. 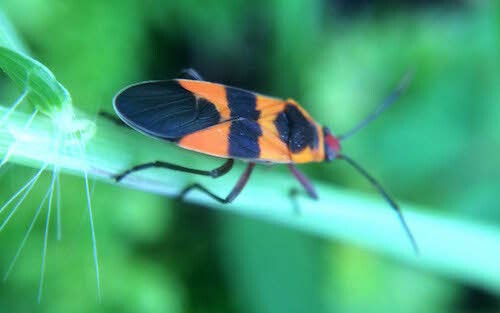 For capturing small creatures, such as this milkweed bug, or flower details, I like to use the macro lens I bought for my cellphone. How to document your finds also depends on the age and interests of the children involved. Younger ones might enjoy picking flowers to press, while older ones might enjoy photographing their finds. We also tried using Sunprint paper to document some of the more interesting shapes, such as dog fennel, with its feathery green “arms,” and the perennial Sunprint favorite of ferns. Creating a bio-inventory, however, is more than collecting pretty pictures. It’s also about identifying what you find. The data sheet I created is simple and covers the basics. The sheet has room for the image, and space to include the name, growing habits, location and notes about the object. The data sheet is broad enough to work for plants or animals, and it can be as detailed or as simple as you want it to be. I’ve included sample data sheets, and you can always create sheets that better match your specific interests. One data sheet is a full page, and the other page has two entries on one page. I thought the half-sheet entries would be nice to put on sturdier paper or laminate once completed. The smaller sheets could be put on a jump ring and used as a field guide on hikes. 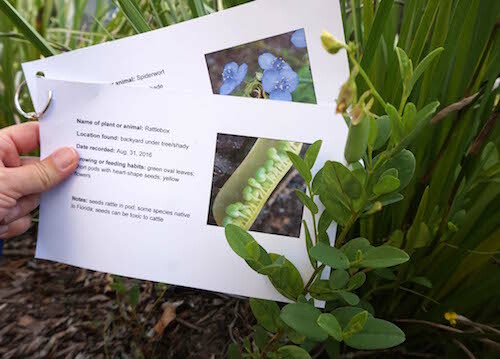 The bio-inventory sheets can be used like a field guide as you explore nature. Those with older children may want to incorporate more technology into this project by using apps like Instagram, iNaturalist or Project Noah or event presentation software. Photos and field notes could be used to create a slideshow at home to document your finds. Of course, there’s a lot of research potential inherent in this project, too. While I knew dogfennel by sight when I documented it in the backyard, I later searched for it online. One thing I didn’t know is that dogfennel flowers and reproduces by seed and by its lateral root system. I don’t recall seeing dogfennel in flower, but I know I will look for it now. 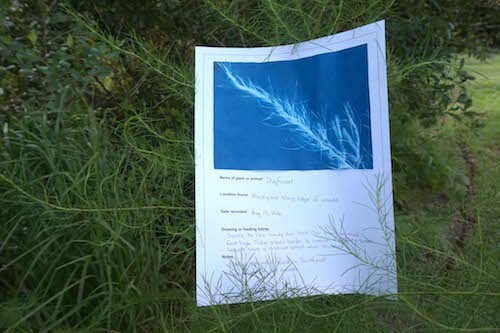 We used Sunprint paper to capture the feathery leaves of the dog fennel. The Sunprint was then taped to the data sheet. A bio-inventory is not a project you can do in a day; it’s an ever-changing document that allows you to chart the changes in your environment. It reminds me of a garden journal, where you can track your successful (and not-so-successful) plantings to allow you to make good decisions on what to grow and when next year. While the bio-inventory isn’t tracking your green thumb, it is tracking the health of your chosen environment. It also helps you to make decisions about what plants are “weeds” and what plants play an important role in the health of your particular ecosystem. It’s also a good excuse to get the kids outside to see what they can discover! 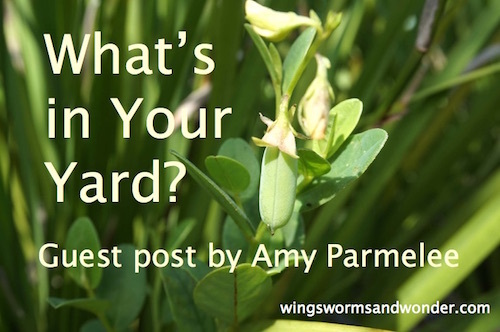 What would you like to learn more about in your yard or local park? Share in the comments below! Share pics of your nearby nature research on Instagram #wingswormsandwonder so Amy and I can see! Download your data sheets created by Amy here! For help identifying the plants in your area, try the USDA’s site at http://plants.usda.gov/ or your local extension office. For more guidance on connecting with nature through nature journaling, check out the Wings, Worms, and Wonder Nature journaling school. There’s even a free class you can take! 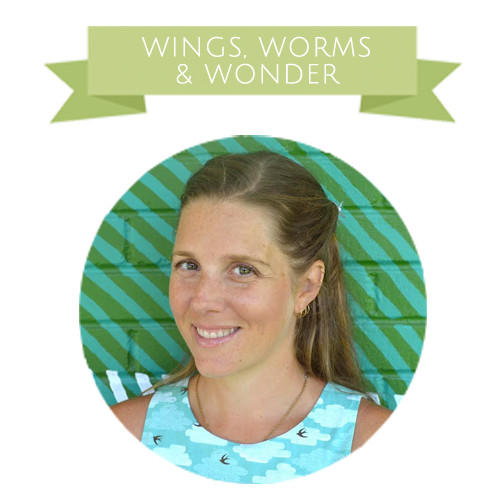 Get the Book Wings, Worms, and Wonder for 40+ activities to connect you and the children’ in your life to the nature right outside your door!